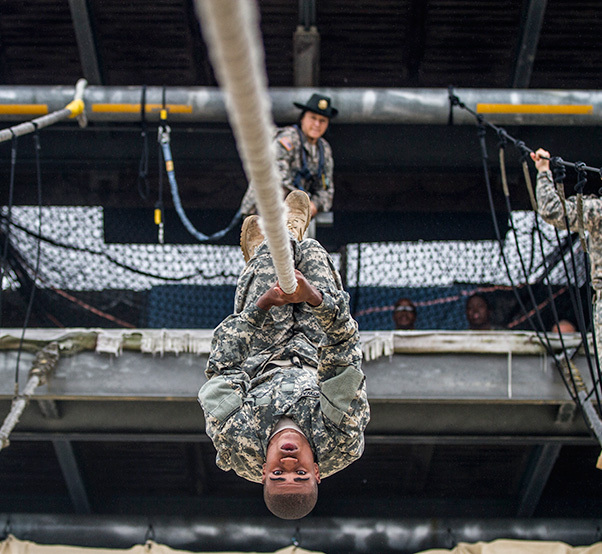 After losing his balance on a rope bridge obstacle, a Soldier in Basic Combat Training with E Company, 2nd Battalion, 39th Infantry Regiment, attempts to complete the task by using pure upper body strength to shimmy across to the other side with his Drill Sgt. looking on, Oct. 28, 2015. 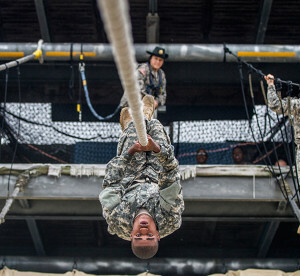 Soldiers in Basic Combat Training must complete all tasks at Victory Tower on Fort Jackson, S.C., which also boasts a 40-foot repelling wall, in order to graduate. Since 1973, new recruits in what is now called Basic Combat Training at Fort Jackson, S.C., have been challenging and conquering the 40-foot monster known as Victory Tower in their first week of training. “That was crazy!” said Pvt. 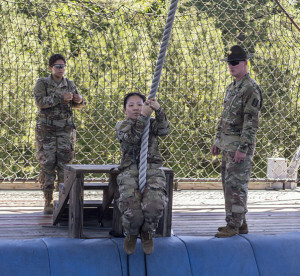 Lisdy Sarmiento, A Company, 2nd Battalion, 13th Infantry Regiment, now in her sixth day of training and a future combat supply specialist with the Army Reserve. Sparks, one of several drill sergeants facilitating training at Victory Tower with A Company, June 8, says “this helps them [Soldiers] see that they can accomplish big feats that they never thought they could do. Staff Sgt. Trevin Sparks, a drill sergeant with A Company, 2nd Battalion, 13th Infantry Regiment at Fort Jackson, S.C. watches as Soldiers in their first full week of Basic Combat Training cross a pit on top of the 40-foot high Victory Tower, June 8. “This is as new to me as it is to these Soldiers. They’re in their sixth day of training I think and I’ve been here for five,” said Allan Kendall, an army reserve drill sergeant with F Company, 1st Battalion, 321st Infantry Regiment, 98th Training Division (IET). Although Victory Tower is just the foundation for the Soldiers training, it’s an important one.